These are nice. I like the cordless feature and the pricing was superb. They're "flatter" than I like my Romans. I prefer the kind that balloon out at each seam. These just form a flat sheet when extended but they will work for now. My dog likes to stick his head underneath and I've been going through $200 blinds every year so these are a breath of fresh air. The LOOK is at least as good as the more expensive type. 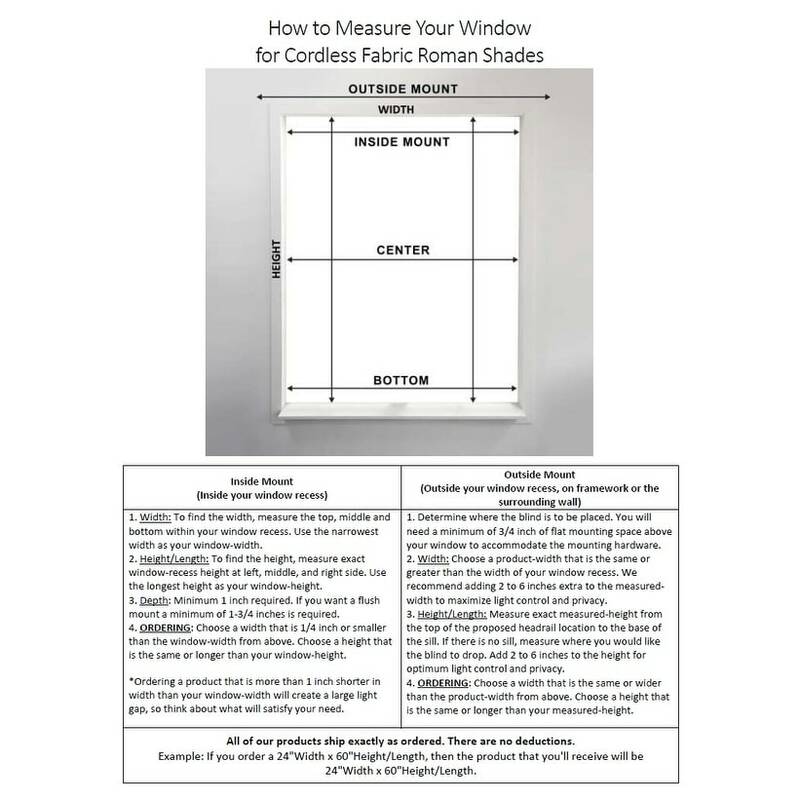 Keep your windows chic and safe with this easy-to-use Roman shade, featuring a cordless lift mechanism. This versatile light filtration shade provides privacy when drawn and a soothing, warm glow from the sunlight. This shade provides privacy while filtering and softening incoming light. Product Features: Energy Efficient, Softens incoming light, Inside or Outside window mounting capability. We recommend you to refer to the How to Measure Your Window guide in order to select the appropriate size for your window. For an inside mount, please choose a width that is 1/4 inch or smaller than the window-width from what you measure. Please note that the actual color may vary since each computer monitor has different capabilities to display colors and that everyone sees these colors differently. We try to edit our photos to show the samples as life-like as possible. We suggest that you order a quantity of one item before ordering a greater amount to test the color. Care instructions: Packing and shipping will typically cause the fabric of this product to wrinkle. First, allow all items to hang for a few days so that the wrinkles can relax and begin to fall out. If necessary, steam the shade on a low heat setting to remove stubborn wrinkles. However, be aware that if the temperature is too high, it could damage the shade. To clean the fabric on the shade, use a feather duster or vacuum lightly using the soft brush attachment. Dimensions 24.0 In. X 60.0 In. These roman shades are just what I wanted. I ordered the sand color and its more of a darker silvery gray but still works with our decor. I love the cordless lift feature. The fabric is really nice. It is not room darkening but rather a light filtering but not see-through either so there is privacy but not dark like my last set of roman shades. We put these in our living room with a burgundy wood boxed valance. I just hung this blind up.size is just as stated in description.It is a privacy blind as you can't see through it just some light that comes through but definitely not sheer enough so anyone can see you.I would have given 5 stars but you can see the shadow of the strings that hold each pleats together on the other side so I only have a 4 star rating but I am still happy with them.You can't go wrong for the money as these are 200 to 300 in the big box stores for the similar product and this will do the job just as well. These are wonderful, and color was as pictured, ordered some others from a custom place because of the size, color was not as pictured.